KANNAPOLIS, N.C. (April 3, 2012) - The Kannapolis Intimidators and Carolinas Medical Center-NorthEast have agreed on a stadium naming rights agreement that takes effect for the 2012 season. The Intimidators will take the field at CMC-NorthEast Stadium to open the season on Thursday, April 5. A new stadium logo will greet fans entering the gates and will be featured throughout the ballpark and on team printed materials. The name was announced in front of the stadium today. "Carolinas Medical Center-NorthEast has had a long and distinguished history of bringing excellent healthcare to residents of Cabarrus and Rowan counties. As part of our mission, we encourage healthy lifestyle habits including team sports and family activities," said Phyllis Wingate, president of CMC-NorthEast. "Our partnership with the Kannapolis Intimidators continues a tradition throughout our 75-year history of supporting local companies and organizations, and encouraging activities that bring families together. We're proud that the new stadium name reflects our ongoing support of local entities, and look forward to a continuing relationship between the Kannapolis Intimidators and CMC-NorthEast." 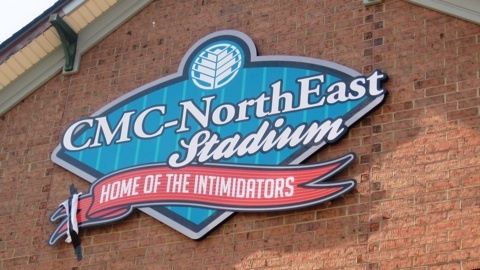 CMC-NorthEast has been a supporter of Intimidators baseball since the team's inaugural baseball season in 1995. The 457-bed hospital is located in Concord, N.C., first opened in 1937 and joined the Carolinas HealthCare System in 2007. The ballpark opened its gates in 1995 as Fieldcrest Cannon Stadium and hosted 17 seasons of professional baseball even after its namesake mill closed. With a new name, the ballpark also welcomes a new neighbor as CMC-Kannapolis recently opened. Carolinas HealthCare System (www.carolinashealthcare.org), one of the nation's leading and most innovative healthcare organizations, provides a full spectrum of healthcare and wellness programs throughout North and South Carolina. Its diverse network of more than 650 care locations includes academic medical centers, hospitals, healthcare pavilions, physician practices, destination centers, surgical and rehabilitation centers, home health agencies, nursing homes and hospice and palliative care. CHS works to improve and enhance the overall health and wellbeing of its communities through high quality patient care, education and research programs, and numerous collaborative partnerships and initiatives. The Intimidators open the 2012 season - the 18th year of professional baseball in Kannapolis - at home on Thursday, April 5, 2012 against the Hickory Crawdads. The Intimidators drew 138,487 fans in 2011, setting a new franchise attendance record. For 2012 ticket information, please call the box office at (704) 932-3267 or visit www.IntimidatorsBaseball.com.